Most great adventures require some planning, and summer camp is no exception. But we make it really easy with our guide to stress-free packing and our clear and comprehensive packing lists. In fact, that smooth, forward-thinking process can help to revitalize your packing goals and processes for family trips too. At camp, kids learn how to coexist with and actively preserve the environment around them. The Bay Area’s vibrant green and wildlife inspire kids to return its generosity. When you start to put together a packing list for the whole family, you may notice how fast that carbon footprint can add up. Between plastic bags, throw-away mini shampoos and conditioners, and bottles of sunscreen—there’s actually a whole lot of “waste” that accumulates during summer travel. 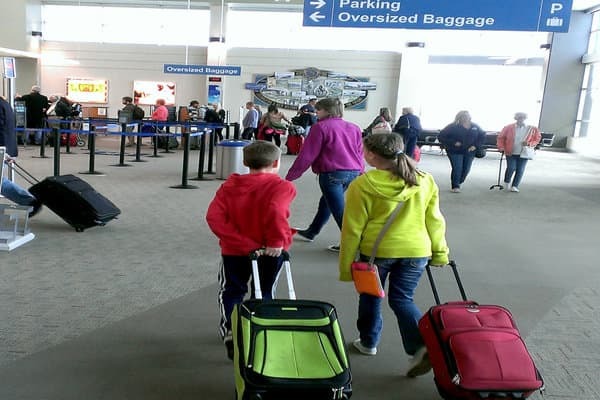 Packing for trips can be a collaborative effort between parents and kids, and it can also be a great way to have a conversation about how to reduce waste. With a bit of extra care and a few simple swaps, you can easily make your family’s packing more eco-friendly for your adventures this summer and beyond. We’ve put together some tips for how to pack the ecological way that doesn’t add a lot of stress or extra steps. Lots of lodging places today are noticing the impact of their toiletries—from disposable plastic shampoo, conditioner, and body wash bottles to soap. At many places today, soap is being recycled, bottles are being made using biodegradable materials, and product labels are even being printed with soy inks. When it comes to packing, one of the easiest things you can do is invest in a set of reusable toiletry containers and a case to keep them in. You’ll be using them for years to come—and it can make the packing process quick and easy by just refilling from your full-size supplies at home. Since you’re going to be adapting as you go on your trip, you may want to think about packing a set of reusable snack and sandwich containers (even if it’s just for car rides and hikes). There are a whole lot of plastic baggies that get used once then tossed, and you can instead encourage your family to be the trendsetters when it comes to all things green. The great thing about these reusable items is that they don’t just have to be used for travel. They can become a staple item when packing kids’ lunches for school or snacks on the way to activities. Home stores sell easily washable and waterproof baggies with velcro or snap or zip closures, or you can always look at online stores for a growing assortment of colors and designs. In addition to protecting your family members’ skin and lips, there are certain products to pack that can help you be mindful of the environment, too. When sunscreen rubs off in oceans, lakes, and rivers, it can leave chemical residue behind which can be harmful to marine life (coral reefs, in particular). Look for natural mineral-based sunscreens that are also biodegradable. Many are made with things like coconut oil, green tea, and grapefruit essential oil—meaning they’ll smell good and you’ll feel good about what you’re putting on your kids’ skin. When it comes to lip balm, look for organic and natural options to hydrate and moisten. From sunflower seed oil to aloe vera to beeswax—pucker up for your planet! Bamboo is a durable and highly sustainable resource. So, packing portable bamboo utensils for eating on the go is a wonderful way to cut down on your family’s use of plastic cutlery. Many of these utensils come in to-go travel packs, making them perfect to throw in a picnic bag or snack bag—anywhere! In fact, they’re good for the whole family. And just like your eco-friendly baggies, after the trip, you can take them to work, school, soccer games, or keep them in your glove box or bike basket to feel extra good about the food that’s nourishing you while you’re out and about. And if you ever visit Kennolyn Camps (and you really should) or see us at a Bay Area event, ask us for one of our reusable plastic utensil kits. Kids and families love the versatile knife-fork-spoon sets. At summer camp, kids come to appreciate how important it is to be prepared with a camera, charged up and ready to snap. So, they’ll be on board with having extra batteries for the family trip too. But to power their reactions, batteries are made from a variety of chemicals—like nickel and cadmium—which are super toxic and can harm both humans and our environment. That’s why rechargeable batteries are an excellent choice to help conserve resources, protect our Earth, and to save money, too! Plus, you can easily find battery chargers that are compact and convenient. If you’re looking to pack all these eco-friendly goodies in an eco-friendly bag, check out bags made with post-consumer material. Today, you can find pretty much any style of bag you’re looking for—from a duffle on wheels to more traditional suitcases—that are made with the environment in mind. Not only do many companies use sustainable materials and dyes, but they also create their products using ethical and fair practices. They’re strong, durable, and able to withstand the test of time when you’re packing up to provide for the whole family during your time away from home. Beyond the obvious space you need to pack your clothes and other necessities, it’s also good to throw a few extra bags in there to be prepared for any souvenirs you might pick up along the way. You can use one you have on hand from grocery shopping—or, you can get a little bit fancier and surprise your kids with a personalized souvenir bag for all their treasures. One of the best ways to get kids (and adults) involved in taking care of the environment is by getting out in nature—soaking up the sun, breathing in the fresh air, and appreciating the beautiful bounty of the incredible world that surrounds us. At Kennolyn Camps, we like to encourage mindfulness and finding peace through hiking, walking, swimming, and dancing. In order to get your family prepared for nature explorations, remember to pack things like swimsuits, comfortable shoes to roam and explore, and clothes that can bend and stretch and move just as you do! Whether you’re doing one of these things or all of them, any effort made to encourage environmentally conscious attitudes is a giant leap in the right direction. When you are putting in the small effort to effect and inspire big changes for the environment, you set the example for your kids to emulate in their daily lives. We have one world to love—and if we wrap our arms around it in a kind and nurturing way, and help teach our kids to do the same—we can love it for a long, long time. At Kennolyn Camps, we treat our campers like we treat our environment—with love and appreciation. We believe that an eco-friendly summer camp experience can begin right in an eco-friendly bag! Get in touch to learn more about our special location, and how we do our best to treat all things with care.